Donned in dobok, the taekwondo clothing, a Bridgetine taekwondo jin grabbed bronze in the Regional Sports competition held in a covered court in Victoria, Laguna, February 13-17. 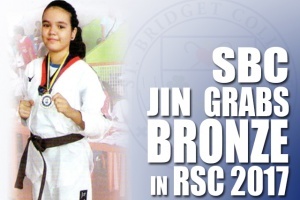 Nicole Anne Lollback, a grade six pupil, managed to get the bronze medal after winning against the jin from the division of Tanuan. Her combinationof powerful roundhouse kick, spinning kick and front kick became her edge over other opponents from other divisions in Region IV-A. She also defeated the taekwondo jin from the division of Tayabas. Lollback received the Oustanding Performance in Taekwondo award this school year. Aside from Lollback, Agela Rose Beatriz Barbosa, Lanz Nataniel Silang and Inno Cedrick Calub participated with their spins and rallies in table tennis category. In volleyball, Dana Joseah Alvarez, Krachelle Joy Cantos, Ma. Zandy Valerie Cueto, Sally Trinity Garcia, Charlene Juliana Pastor, Karla Franchesca Sadia, Janne Rendan Mortera, Franc Dustin Cabuñas and Teofilo Orayan made their presence felt in RSC. Ysabelle Arwayne Muyong, Paula Matienzo and Ronn Gabriel Generoso also represented the division of Batangas City in swimming.